Home Apps How to interrupt, But Politely. I KNOW! I KNOW! It sounds difficult, but it’s not. The only reason that it looks like an impossible task is because the word ‘interrupt’ comes with a negative connotation, but not anymore. If you live in Delhi then there is a very slim chance that you haven’t traveled in our beloved Delhi metro and if you have, then you have definitely suffered the misery of being in a jam-packed one. A few days ago, while I was in one such train, I couldn’t help but overhear (along with many fellow commuters) this sweet little chatterbox telling her friend about her new job, marriage plans, life goals and what not. It was only after a good 20 minutes that this friend HAD TO ask the “chatterbox” (and quite rudely) to STOP TALKING! In the end, the poor friend came out as an impolite person which, according to me, was quite unfair. The reason behind sharing this little anecdote is to bring your attention to the fact that while we are in a conversation, at times, it becomes very important to interrupt someone. It might appear as an inappropriate thing to do, but if done correctly, you will never come out as a rude person. The speaker is talking way too much. When the speaker has gone off the topic. To give your opinion or to make a suggestion. When it’s someone else’s turn to talk. To take part in an ongoing conversation. Before we take it further, we need to put this in our heads that IT’S OKAY TO INTERRUPT AND IT COULD BE DONE POLITELY. You don’t have to feel bad, be nervous or hesitate while doing so. As long as you do it politely, you may and you should interject. Before you go on, I’d like to say something. Before we move on to the next point, may I add…? Do you mind if I jump in here? I’m sorry but your facts are not completely correct. Sorry I didn’t catch that last part. Sorry to interrupt but can I just tell you something? Sorry if I’m being rude but….. Whether you are jumping into other people’s conversation, it’s important that you do it with a valid reason and not just for the sake of it. The best time to interrupt is when the speaker stops to catch a breath before speaking up again. If your interruption isn’t acknowledged, lift a hand or use eye contact to get the person’s attention. Never hover. A mild throat clearing gesture will turn the heads in your direction. Take advantage of it to say whatever you need to say. Thank the others for allowing you to interrupt. After you say what’s on your mind, show your gratitude for the others allowing you to speak. Now, what happens if you are on the receiving end of someone else’s polite interruption? Well, in that case, you take it with equal grace and politeness. Let’s understand this in the form of a conversation. A: Can I just mention something here? B: Yes, please go ahead. A: I see your point, but there are other aspects to it. B: Of course there are but let me come back to that later. A: Sorry but could you please repeat that last part? Could you let me finish first? Thank you! I value your suggestion but please let me complete. That’s a good point and we can discuss that later. Do you mind if I finish first? Will you let me speak? Can’t you be quiet for a moment? Will you just shut up for a minute, please? Can’t you wait for your own turn to speak? See, being polite is quite EASY-BREEZY. 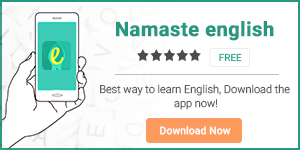 To learn more about better communication skills, download our app Namaste English.